In March 2004, a business trip required me to go from Seoul to Montreal. The question was which route to choose. Obviously, I wasn't going to go via Europe... I had time from Friday morning to Sunday evening. Where would I go... it turned out that the choice of the flight route did not impact costs and I had to stay one night somewhere between fligths. So, I dediced to save the company some money and instead of staying in a boring business hotel, I went for a camping trip in a place I had never been before: Hawaii. 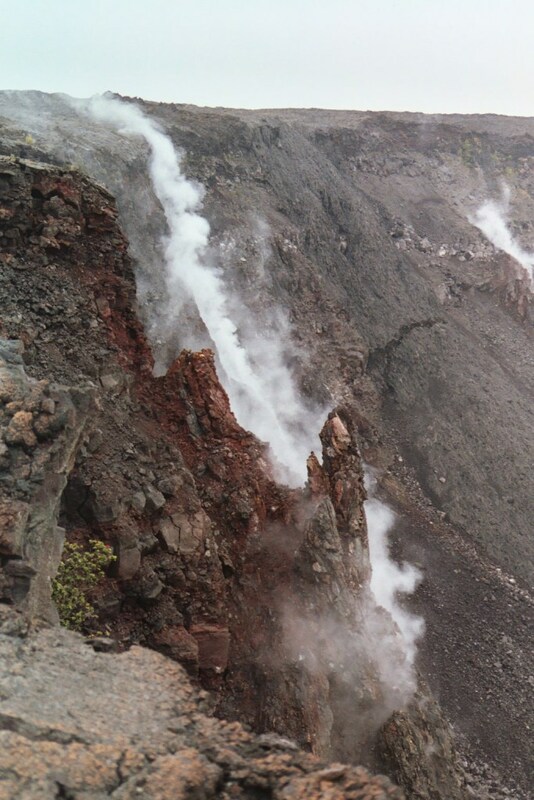 I had always wanted to see a live volcano, so after some research I dediced to go to Big Island and the Hawaii Volcanoes National Park. 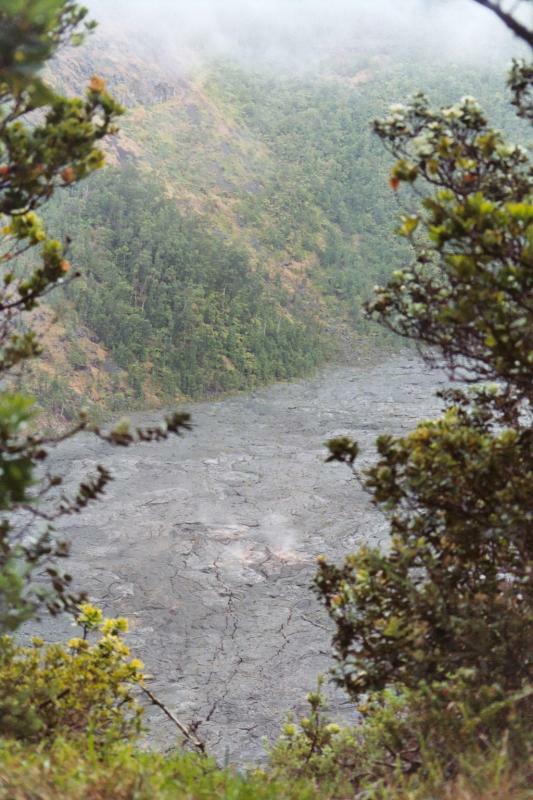 It hosts the world's most active volcano: Kilauea, and its current active part, Pu'u 'O'o vent. There was one problem, however: time. 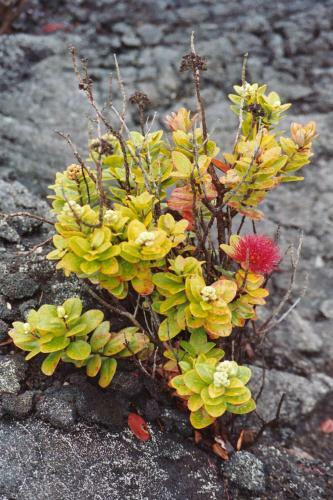 I had barely 30 hours on between my flights in and out of Hawaii, and I needed to do an inter-island flight, rent a car, drive 200 kilometers, buy food, and acquire the necessary permit from the rangers. 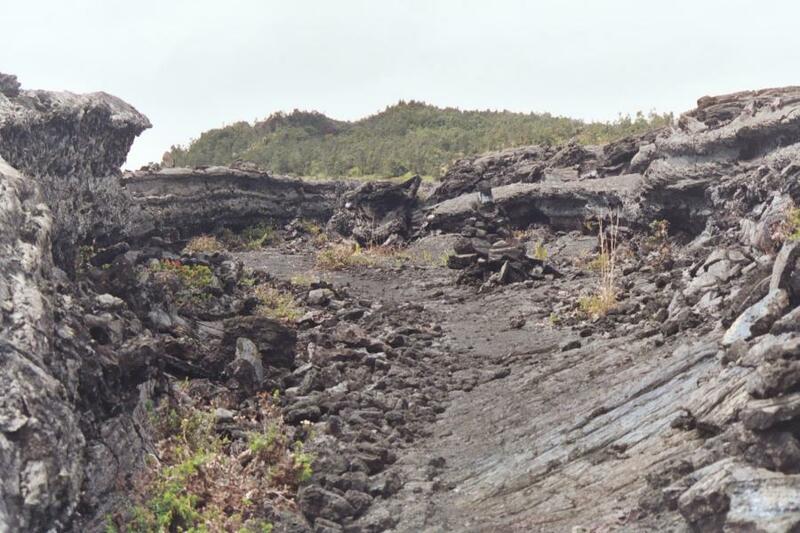 On top of that, Pu'u 'O'o is not easily accessible: a 20 mile hike and camping is required. 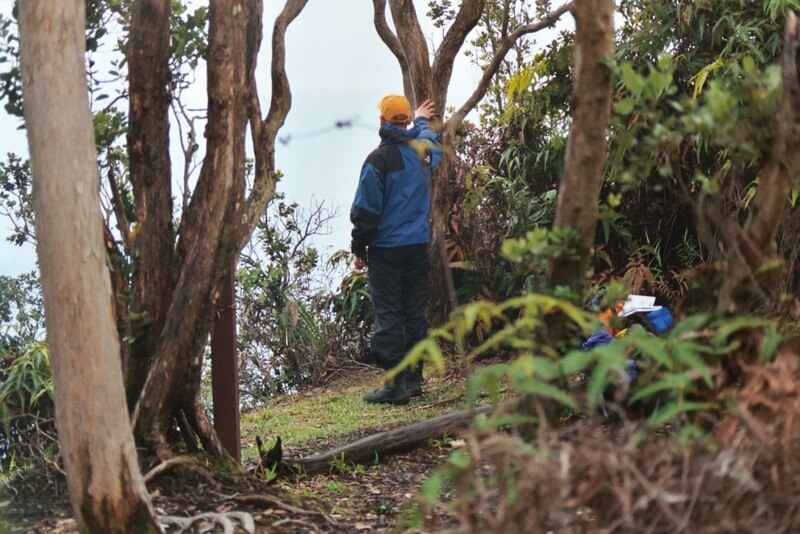 Luckily, everything went smoothly... and I started on the so called Napau Trail. 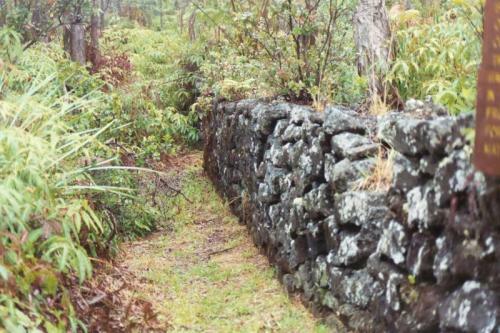 The route runs through old lava fields, and is marked by piles of stones, or "Ahu". The local names are quite funny, at least for us Finns. 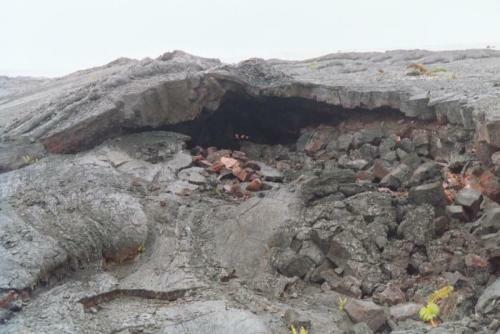 Puu Huluhulu is a couple of hundred years old vent for the underground lava flow that extends under the Napau Trail from the Kilauea Caldera to the Pu'u 'O'o Vent. 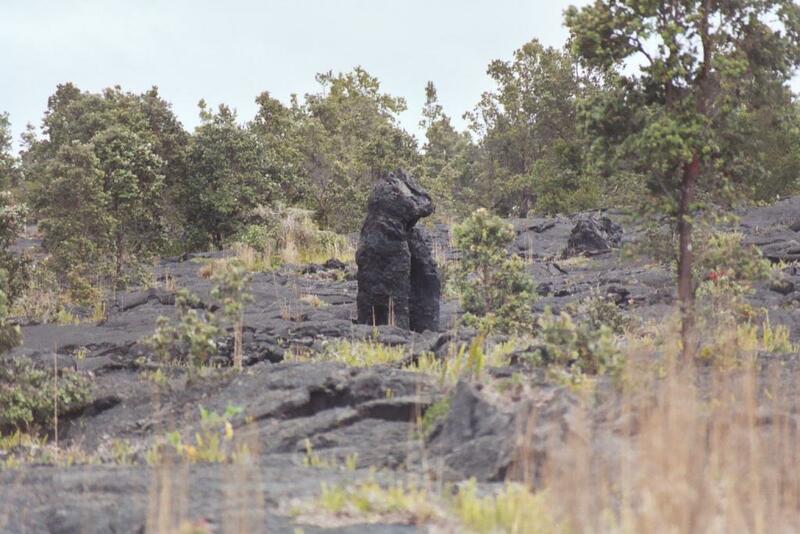 The lava fields have interesting forms. 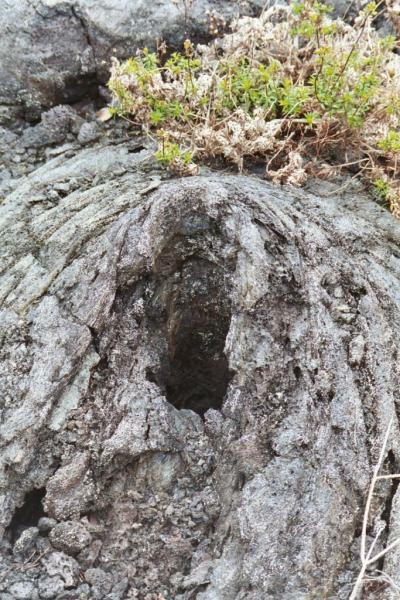 One formation results from trees left under the red hot lava: the lava "freezes" around the tree and leaves either a hole or even a high shell when the height of the lava flow decreases later. 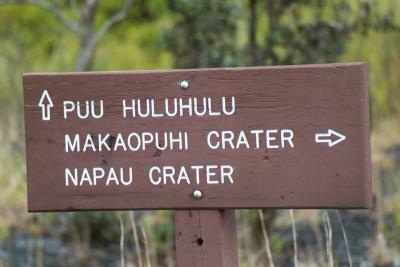 The trail followed a chain of craters, the next interesting crater was the Makaopuhi crater. 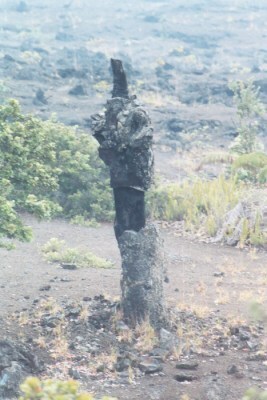 The lava on it is from the 1960s. 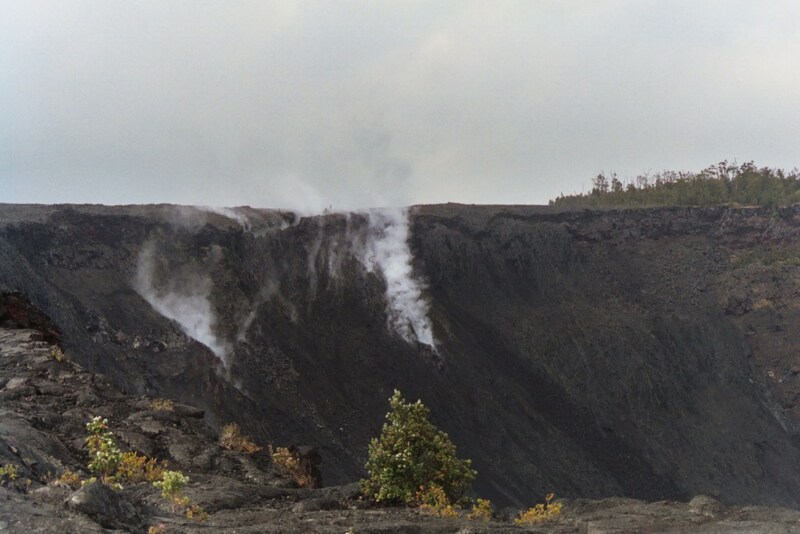 Here am I on the crater rim. 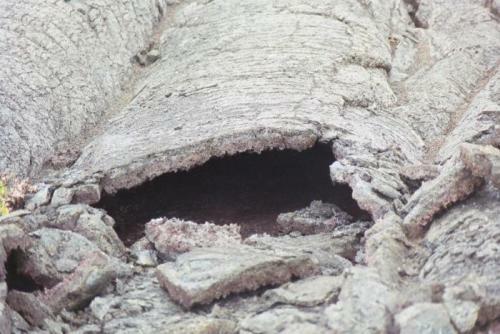 Guess how hard it was to put the camera on a tree for this shot, without a tripod? I had already walked about 5 miles, and I had seen no one... I was assuming I would be alone here tonight. 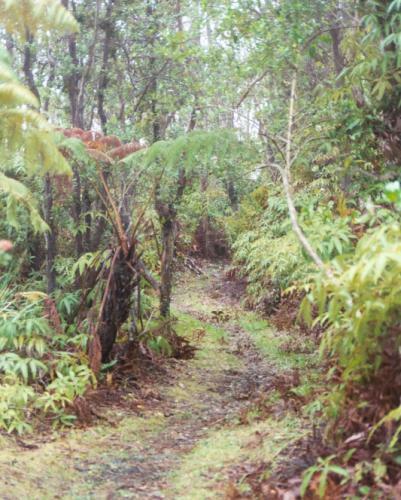 The next crater on the trail was the Napau crater. 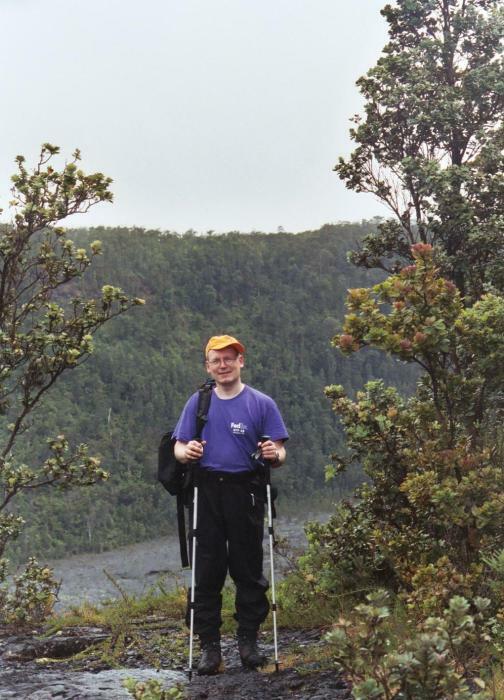 Here I am on its rim, at the Napau Crater Lookout. 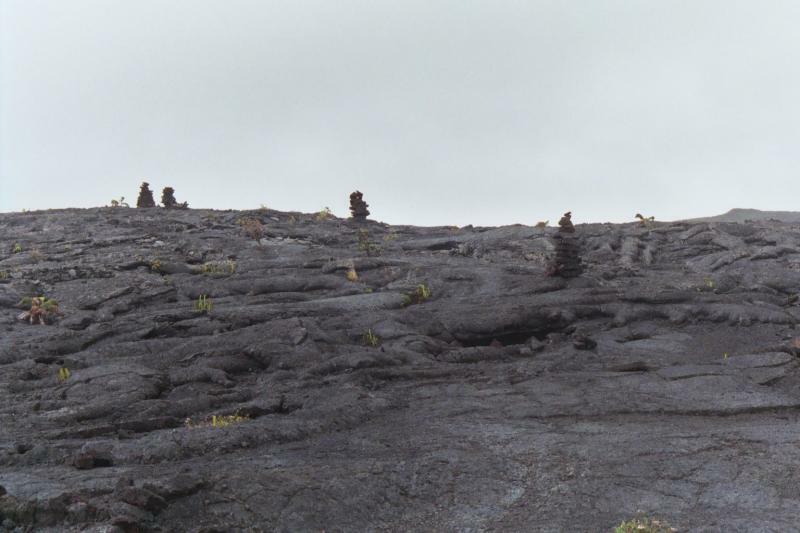 Observe the different colors of the lava; the dark one is just few years old, from late 1990s. 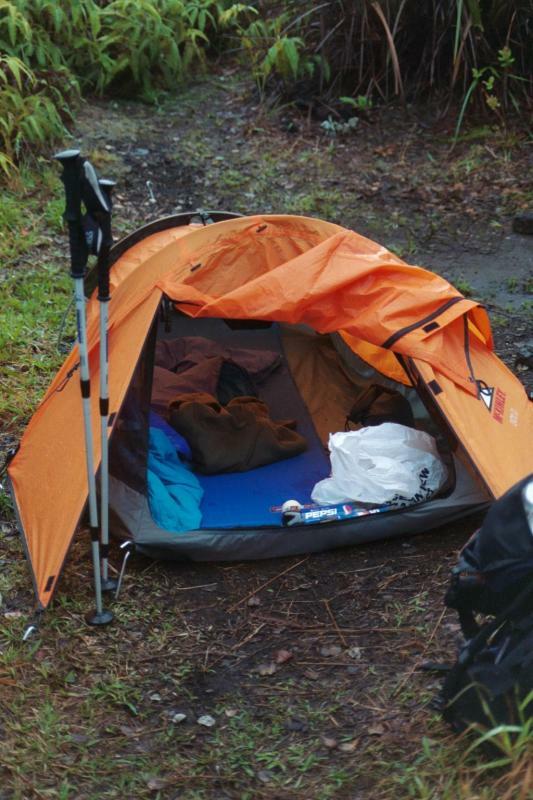 I believed I was alone on this trip, but it turned out that I had some company: a few locals were camping in the site too. 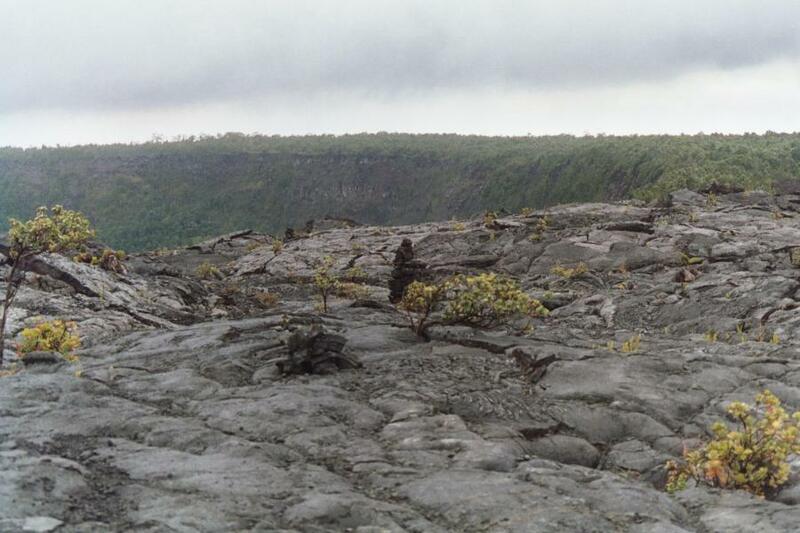 I joined them for a nightly walk from the camp to the start of the Pu'u 'O'o cone; another 6 mile roundtrip. No pictures from this trip either... but it was great. 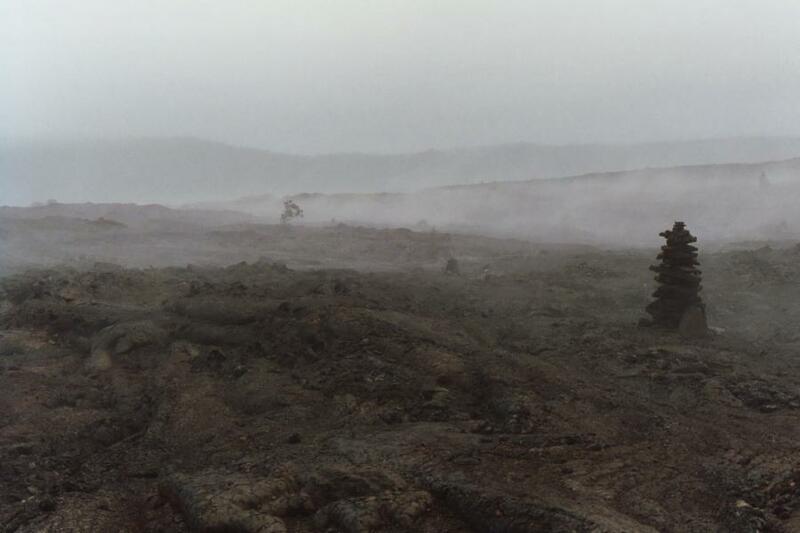 We ended up stopping somewhere in the lava field and did not see lava real close. 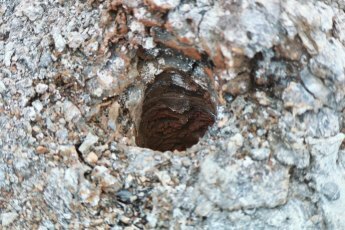 It was dark, there were cracks in the earth with sounds and gases coming out of them, so our guide adviced that its safest to not proceed further. We ended up laying on backs on the desert and watching the red stuff flow higher in the cone. 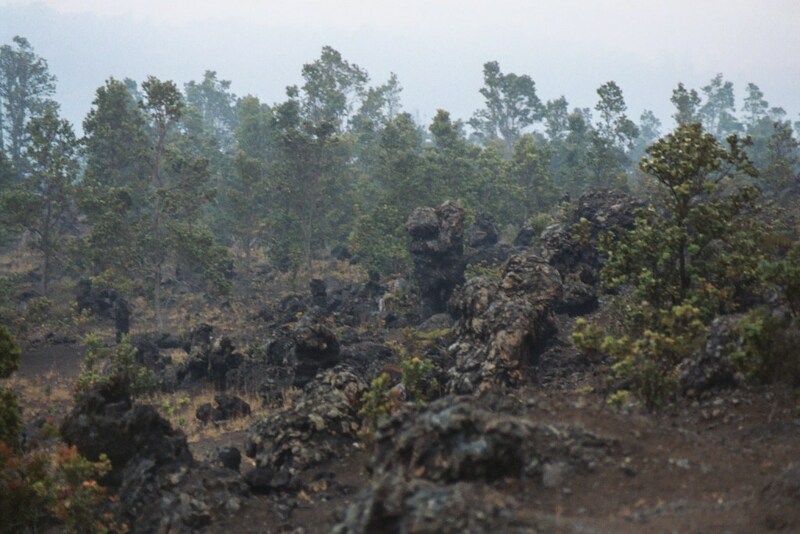 On the way back I took a picture of the area where the rainforest had not yet fully taken over after a lava flow. 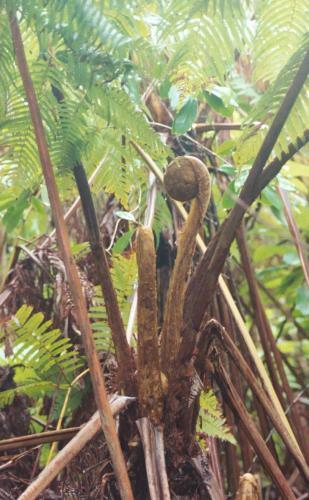 The "pulu" plant that grows in the rain forest had been used around 1850 for the production of pillows (until they realized it turns into dust after a few years). 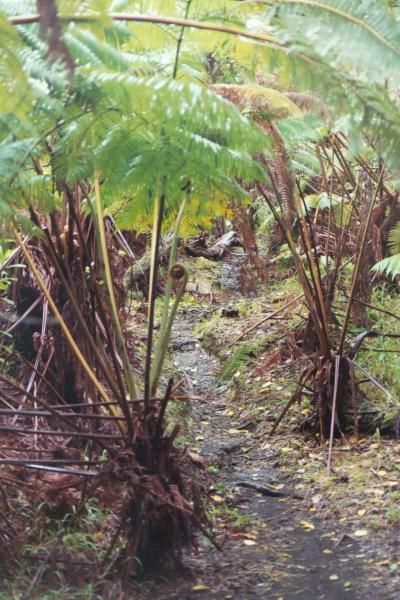 The remains of the Pulu factory are in the forest. 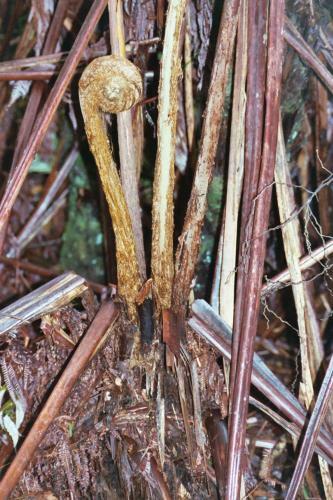 Pulu is taken from this plant's bottom, by pushing your hand into its center and pulling out the brown stuff. 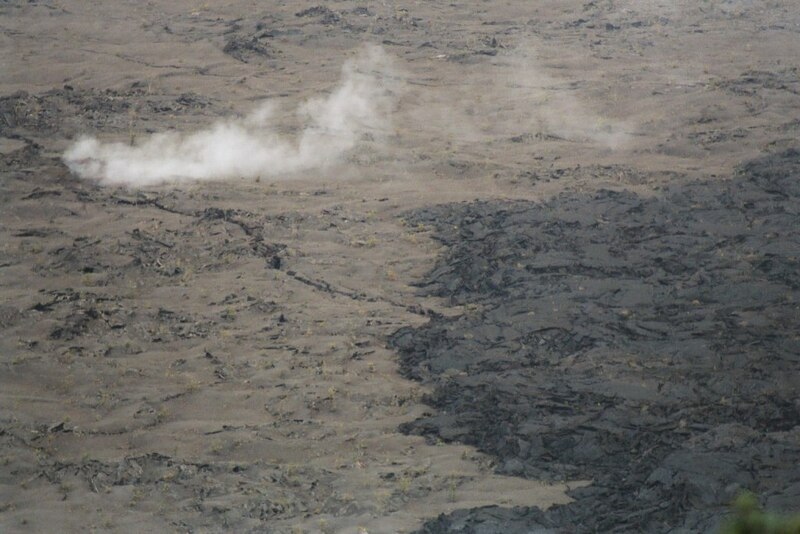 On the way back, it was very clear how some parts of the lava field were still emitting steam and smoke. Close to our camping site, there was stuff coming out of the ground. 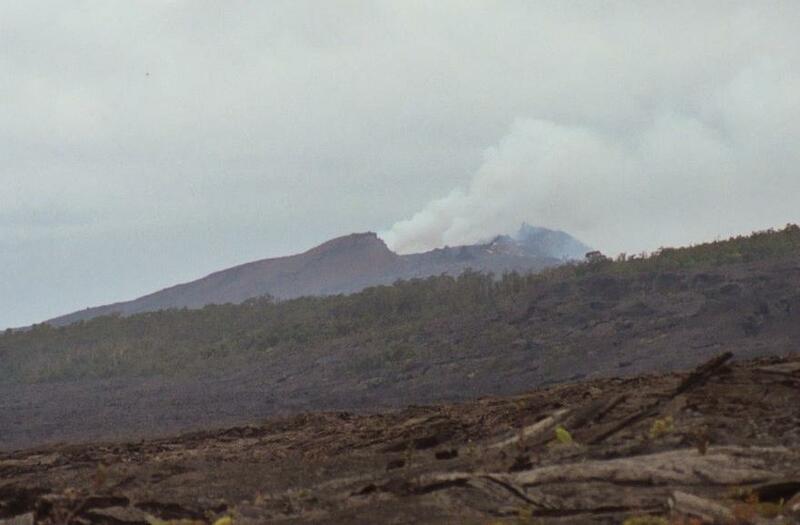 This picture shows the situation from the lava fields on a clear sunny day. You could also feel the heat, it was like a sauna.